Custom Canvas Unlimited, or CCU, makes fully customized skirting to fit the shape, size and style of your 5th-wheel, travel trailer or RV. Our dedicated and consultative technicians work with you, taking measurements, providing ideas and recommendations to ensure you get the best solution for your custom skirting needs. CCU uses colorfast, durable, abrasion-resistant, 18-ounce vinyl fabric available in over 30 colors. We can match or offset your vehicle’s color. We guarantee a tight fit with the highest quality of stainless steel twist locking hardware. With no detail overlooked, we sew a weighted chain into the bottom seam of the skirting making a complete seal around the perimeter of your RV or trailer. Skirting from CCU gives any trailer, or 5th-wheel a polished look. However, that is not its only appeal. RV skirting is an energy efficient tool for remote living. As Idaho experiences all four seasons, trust CCU to customize skirting for you to protect your vehicle from nature’s elements and pests. Custom skirting from CCU can save you upwards of 40 percent on propane costs through the year. With the added insulation from the cold that skirting provides, frozen pipes are a thing of the past, and put a little more money in your wallet. 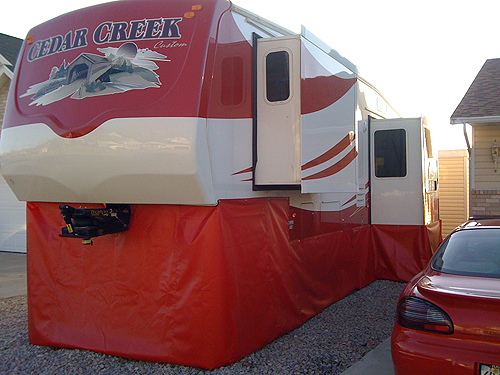 For remote living in Idaho, CCU makes it easy and convenient to get custom canvas skirting for your 5th-wheel or RV. We design and manufacture our products and deliver to you. Our remote mobile access units allow not only deliver to you where ever you are in Idaho, but our technicians will install your custom skirting to ensure its proper fit. Custom Canvas Unlimited are the experts in all things canvas. Our diverse range of products are all customizable-- even our name says it! We are a one-stop shop, we understand the challenges that can come with living in the remote areas of Idaho, and we ensure you get what you need the first time, every time. 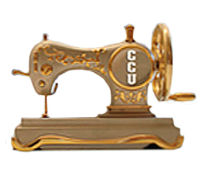 For questions about all that CCU does, to receive a quote or set up a visit with us today simply call 801-671-7775. Let us get to work on your RV’s custom skirting today!